Get ready for some pub-style fish & chips nights in your future. Pacific Seafood is launching frozen Gluten Free Beer Battered Cod. The batter is made with gluten-free Ground Breaker beer, which recently medaled at the Great American Beer Festival. The beer is made in a dedicated gluten-free facility. “Our Classic and Gluten Free Beer Battered Cod is made with local Northwest ingredients ensuring quality and excellence with every product purchased. We are proud to use locally sourced ingredients to provide the most sustainable and delicious seafood possible,” said General Manager of Branded Sales Terry Horgan in a press release. 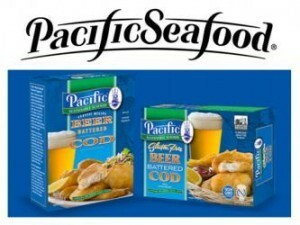 Pacific Seafood is based in Oregon and makes a number of gluten free frozen fish items, including Italian Breaded Sole, Parmesan Encrusted Cod, Fish Sticks, Battered Haddock, and more. See the full lineup here.